Happy Easter! I hope the Bunny was good to everyone! We had a fun-filled day with family. I had a busy pre-holiday week of prep and card making so I'm just finally getting around to blogging my creations. My first card was for Kayne's day care provider. I've used a cutie from Saturated Canary called Easter Dress. 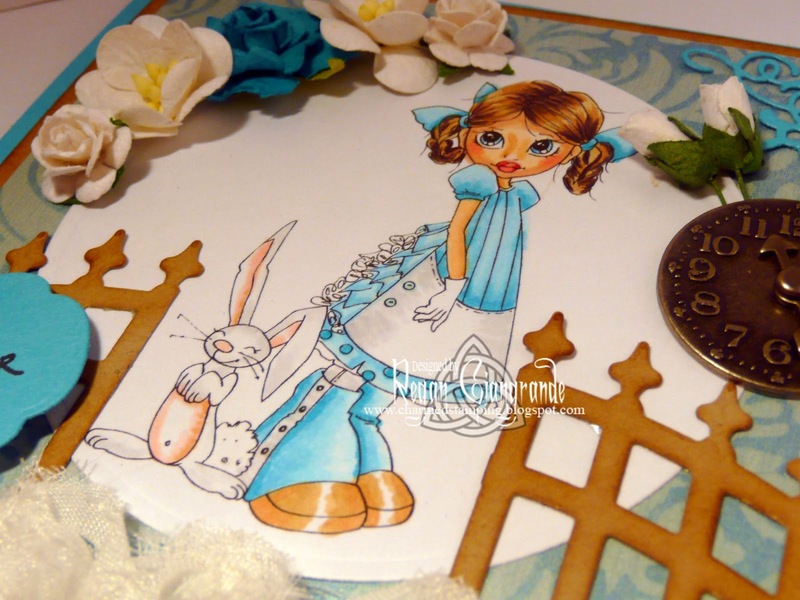 She is colored with Copics and cut using Classic Circles Nestabilities (Spellbinders). Papers are from the DCWV Luxury Stack. I distressed the wrought iron fence (La-La-Land Crafts) with Vintage Photo Distress Ink. 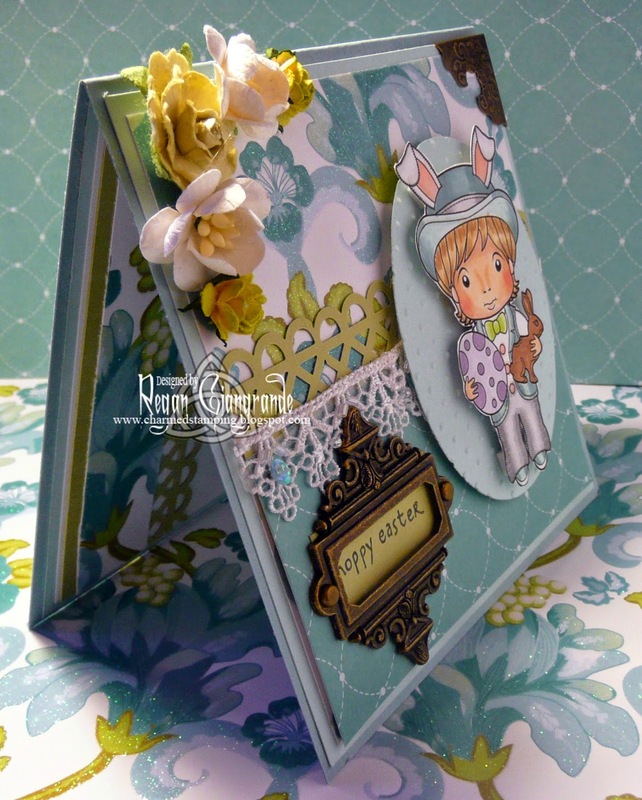 The corner die is from My Favorite Things, a Die-namics called Four Corners. 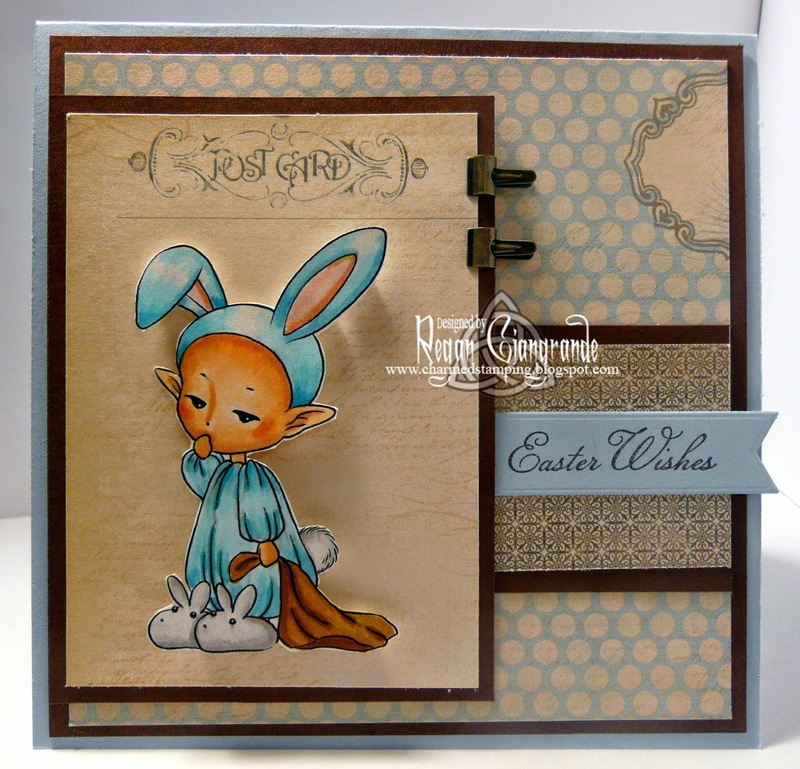 The Hoppy Easter sentiment is from A-Muse Stamps and is cut with Labels Fourteen Nestabilities (Spellbinders). 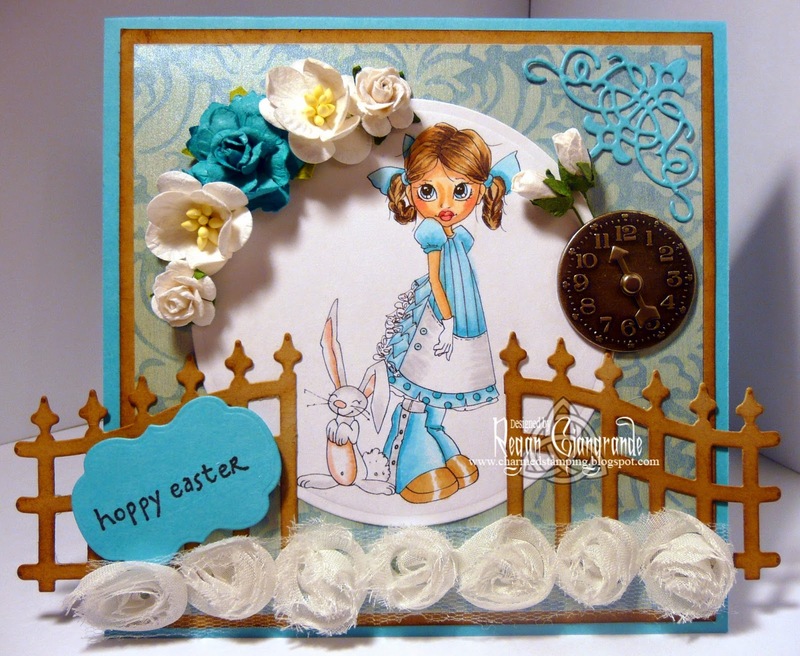 Some flowers, flower trim, and a Tim Holtz metal Timepiece with game spinner finish off the card. 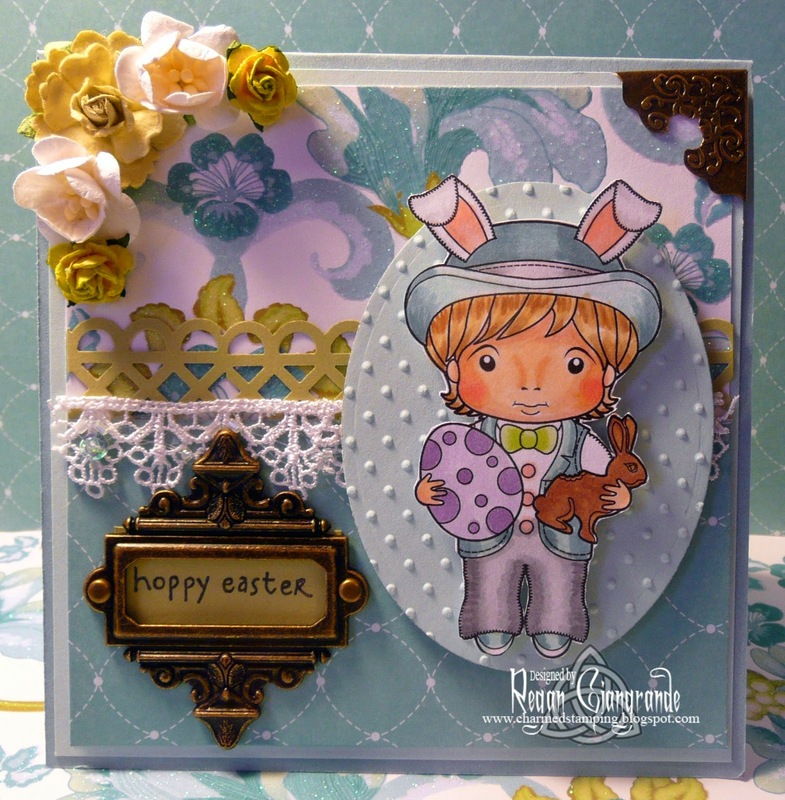 Meljen's Designs' Bunny Love is up next. 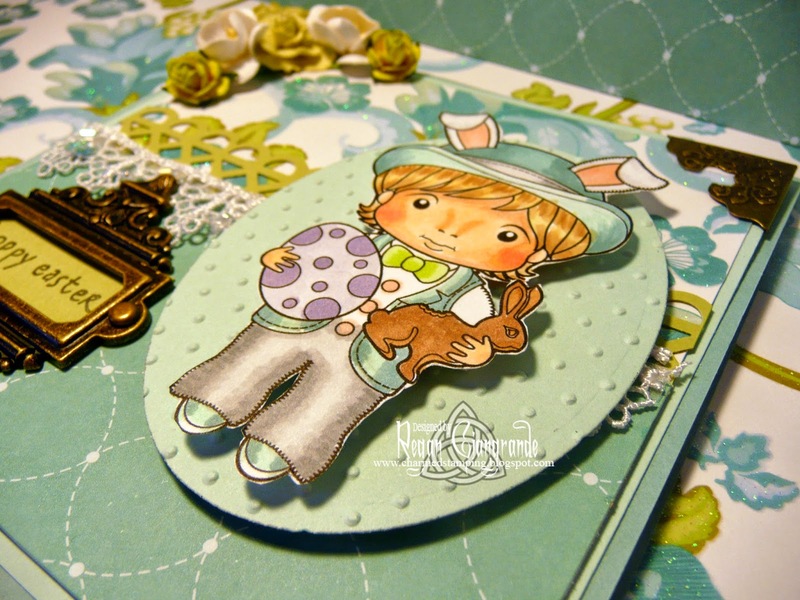 This sweet image is colored with Copics and also cut using the Classic Circles Nestabilities (Spellbinders). The grass was created with a Martha Stewart punch. Sketch is courtesy of The Kraftyhands Challenge (April). I used the Beaded Circle Nestabilities (Spellbinder) and added flat back adhesive pearls. I've embellished with a Heart Banner (La-La-Land Crafts), pennant punch (Stampin' Up), flowers, ruffled trim, and filigree metal corner. Papers are My Mind's Eye - Deena's Penny Lane. I have fallen in love with Stamps by Aurora Wings. 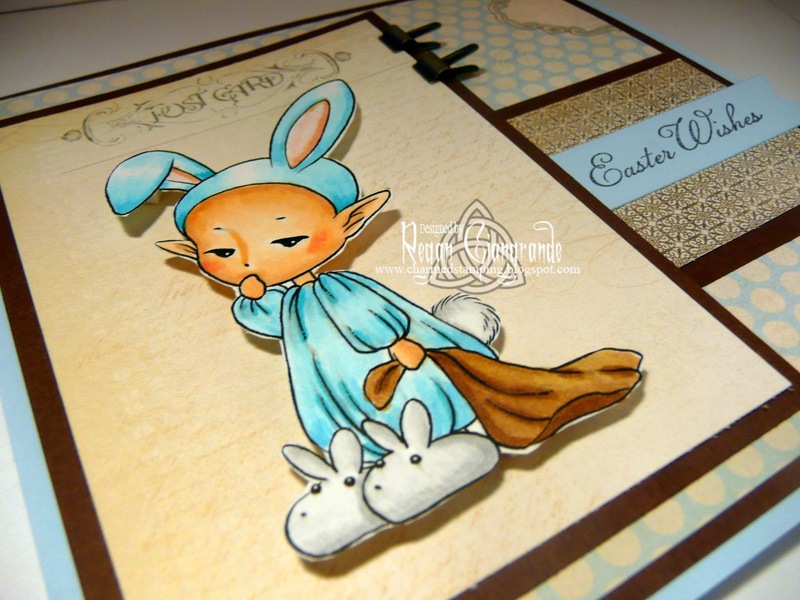 This darling little man is called Sleepy Bunny and I used him for my little man's card. He's colored with Copics and fussy cut. Kayne told me the blanket needed to be brown because his is. Papers are My Mind's Eye - Lost & Find: Portobello Road. 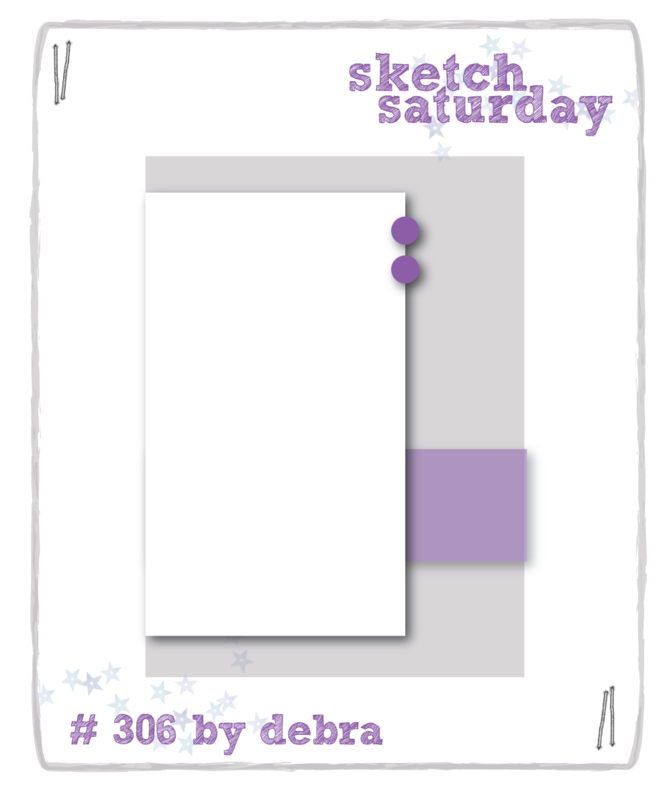 I based my design on the current Sketch Saturday (#306). I kept this one pretty simple with just a couple of metal clips (Stampin' Up). The sentiment is also from Stampin' Up, a set called Something to Celebrate. It's cut with the Fish Tail Flags Stax Die-namics (My Favorite Things). And finally, Easter Bunny Luka from La-La-Land Crafts. This one was for my parents'. Luka is another adorable munchkin who reminds me of Kayne. I colored him up with my Copics and fussy cut him. He's matted on a Classic Ovals Nestabilities (Spellbinders) which has been embossed with the Cuttlebug Swiss Dots folder. The papers are DCWV - The Blossom Song stack. A punched lattice border (Martha Stewart), lace trim, flowers, and Tim Holtz metal ornate plate and metal corner are the finishing touches. 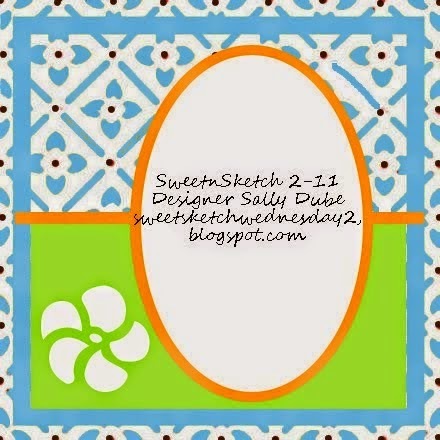 Sweet Sketch Wednesday 2 (#11) provides the layout. As you can see, I've been a bit busy. But tonight I'll be unwinding with the season premiere of Devious Maids, my guilty pleasure! Thanks for visiting! What a fabulous showcase of cards. They are all gorgeous. Thanks for joining us. 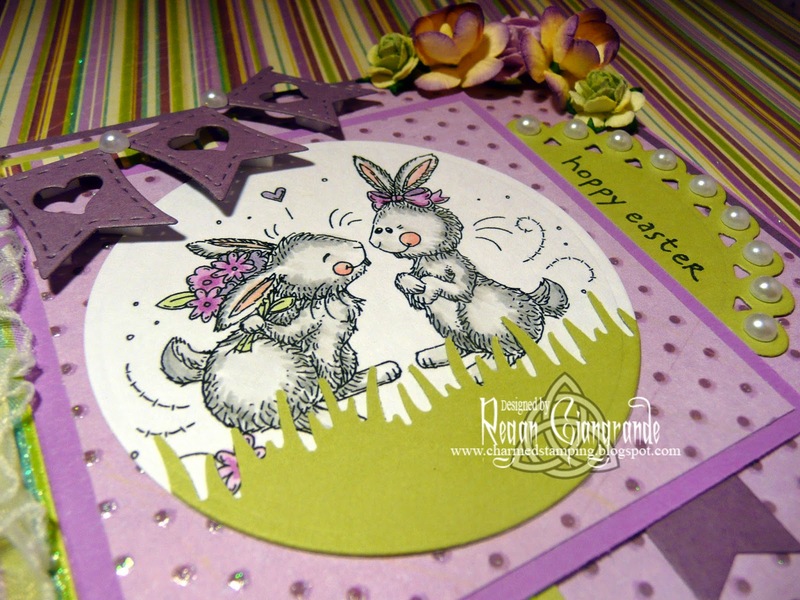 Oh Regan what beautiful cards you've been really busy, they are all totally beautiful and I love this lovely Easter card you've made for SSW2. 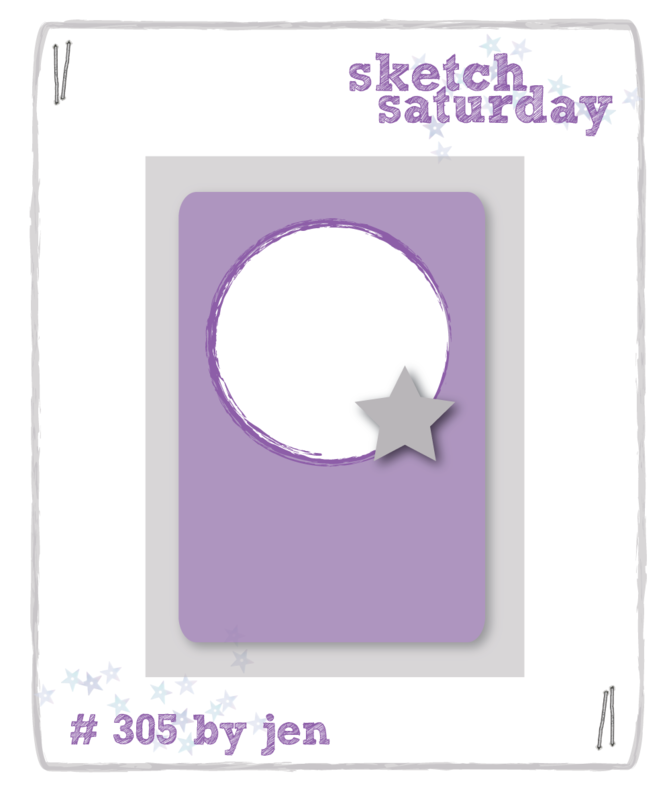 Great card and thanks so much for sharing it with us over at Sweet Sketch Wednesday2 and good luck. Oh my...you have been busy. Love all your card, so pretty. Thank you for joining us this week. You've been very busy and especially crafty. All are beautiful and creative. This post is full of delightful eye candy . Fabulous makes . Bunny Love is a great take on Kraftyhands Sketch . The image is sweet while the lace trim and embellishing are awesome . All your cards are just darling! I think my two favorites though are the Saturated Canary & the Meljen's images. Awesome! Thanks for joining us at SACC this week. Good luck. Beautiful cards, I can tell that you put a lot of work and thought into them. Thanks for sharing with us this week at HIMCR. Wow, I love all your cards (but my secret favorite is the Kraftyhands sketch one) I used that sketch this month too but not nearly as well as you did. Stunning! 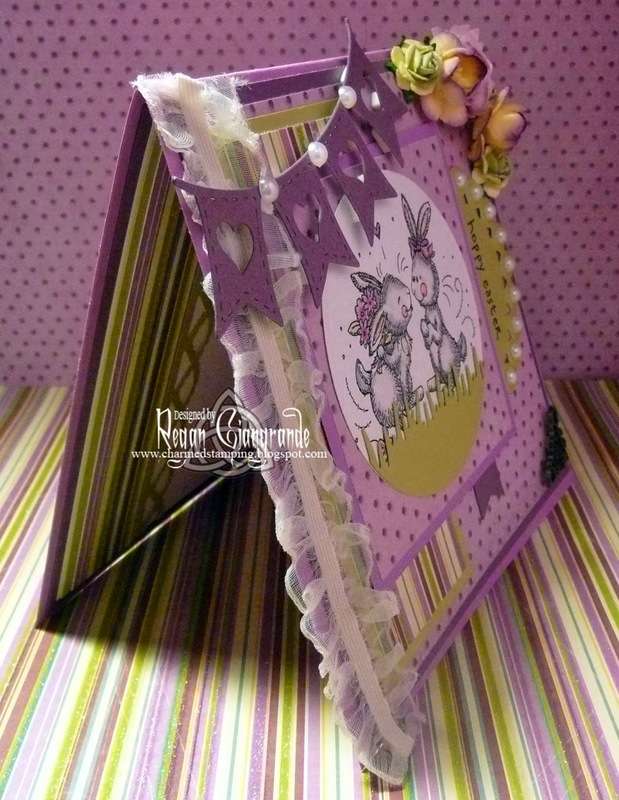 WOW gorgeous Easter cards! 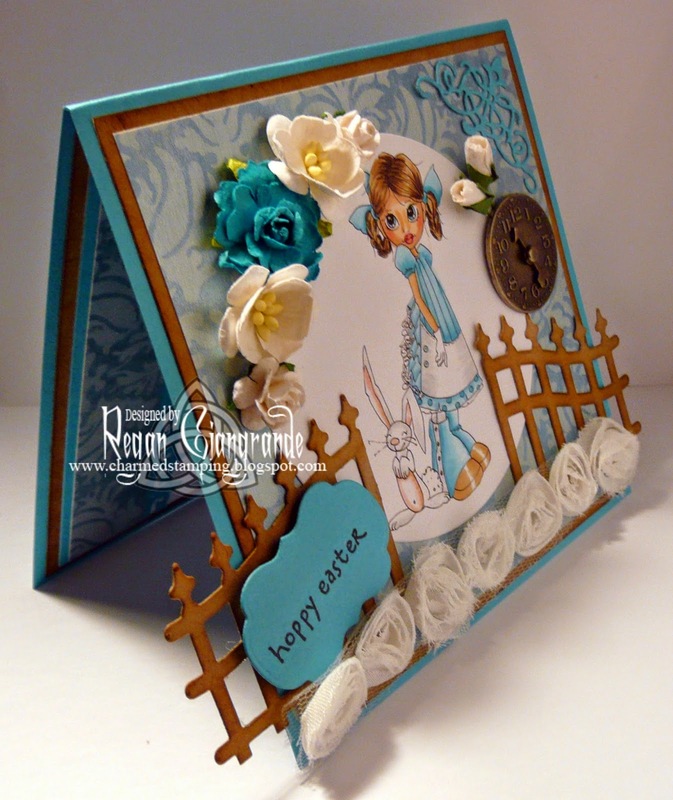 Fabulous coloring and design on all and I love the color combo on the Meljen's card!! Thanks for joining us at Alphabet Challenge Blog! Wow! so many beautifully designed and crafted square card, thanks for joining us at Robyn's Fetish Challenge this week. OMG - what beautiful cards! Your cards in this post are just amazing. You do such a beautiful job in coloring the images. Thanks for joining us at Sweet Sketch Wednesday 2! Fabulous collection of beautiful cards. Great cards! What a mood! Thank you for joining us at STB this week. I just love those baggy bunny pajamas! What a sweet card! 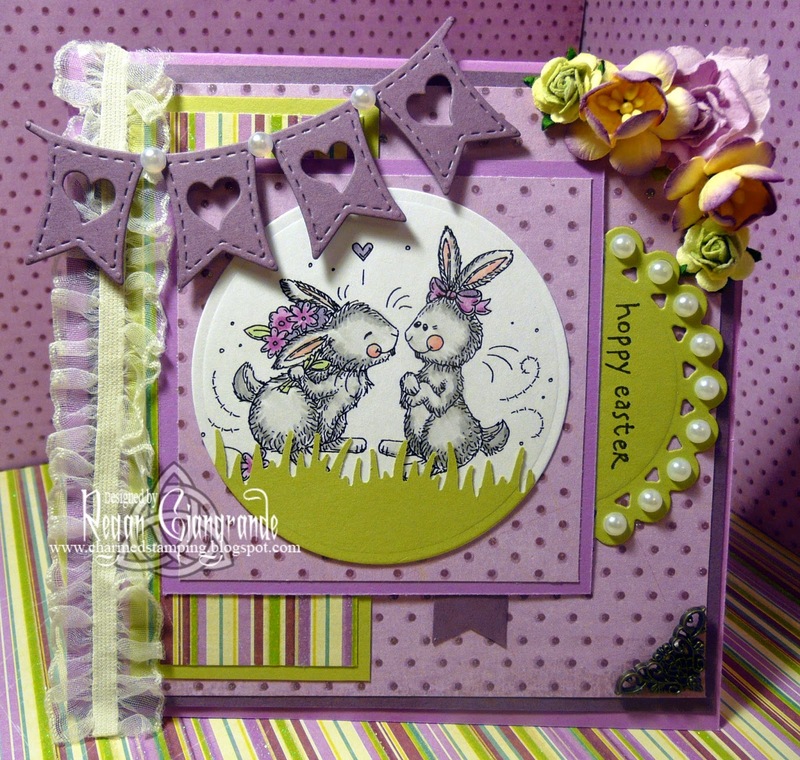 So glad you joined Cupcake Inspirations' Bunny challenge! Beautiful cards, Regan. Each one is so unique and filled with wonderful details to discover. Love the colour schemes and designs as well as the beautifully coloured images. Thanks so much for joining our Anything Goes/Spring or Easter Challenge at Craftitude this fortnight. I've had a delightful visit! Oh wow, Regan, what utterly fabulous cards! They are all so beautiful! Your colours are just gorgeous!